Founded by Marcel Vega (vocals, guitar) in 1989, after various members came and went, joined by Henry Grant (drums, percussion, vocals), Mathias Pacht (bass) and Max Knoth (guitar, vocals) in 1992. Erich Abel (organ) has been a member since 1999. The "eternally, young masters of stuffy pop music" know no haste. In 1996, a mere 7 years after their founding, they recorded their debut album, "Viele Grüße", released in 1998 on Elbtonal/Indigo. After an appropriate period of time "Here come the days of" is appearing on CD/LP on Apricot Records, as well as on CD in Japan on Quince Records. bers young Michele Avantario's comment ("Szene Hamburg", 5/98), "With all those wonderful melodies, those swinging rhythms and, dare I say, a fluffyness in its performance this record is a medium sensation. "Sensation" I don't mind, but "medium??!? OK, but that's why from now on we say "Here come the days of." The days of Bazooka Cain, of course. the days of bazooka cain. their new recording here come the days is a collection of 15 soul-inspired tunes, every single one with a charming 60s touch, a surpreme remembrance of the 80s, and witty and amusing lyrics in german, english or french. 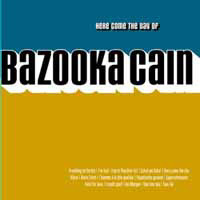 sophistication and metropolitan glamour - the songs of bazooka cain capture humour and melancholy. a grand production with a string and brass orchestra creates moments of euphoria, while other songs appear like gloomy chansons by serge gainsbourg. here come the days of bazooka cain - days of laughter, days of sorrow, days of passion. we're talking about soul! real soul, ladies and gentlemen.